I've always been this person who thought birthday's are special little did I know that this birthday boy is the one who is so special :-) Yes, it was my husband's birthday yesterday and I have been planning his special day for over a month. I have to admit this time I asked him what cake he wanted me to bake, he said a 3 layered one and chocolate to be exact. Then started my confusions, I have to tell you my husband is a picky eater and also my biggest critic, does this sound familiar? He really challenges me with his tastes and likings. One time he would say no butter another time it would be no eggs, thankfully for his birthday cake he was being really nice and let me do as I please ;-). Ok if you are thinking that this is a cake recipe from some big baking legend, the answer is no... 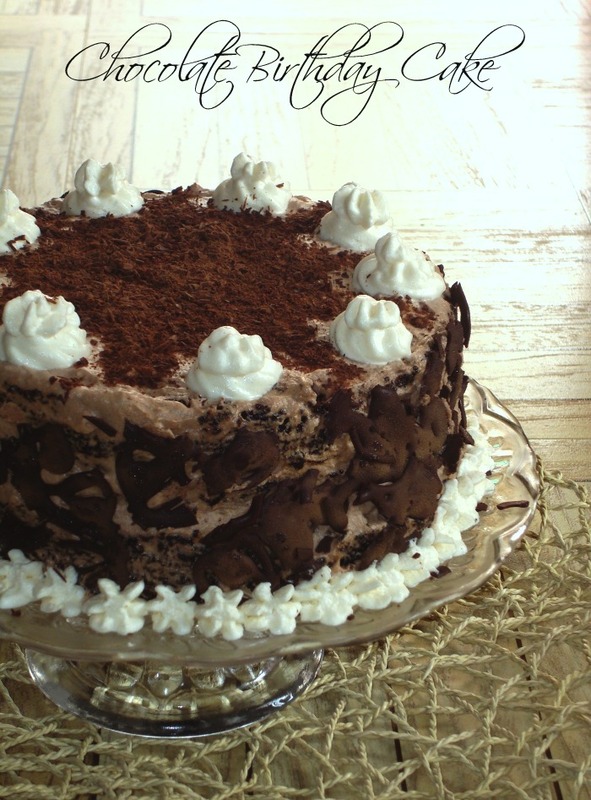 I made a moist chocolate 3 layer sponge and frosted it with chocolate whipped cream and decorated with chocolate curls and shavings. 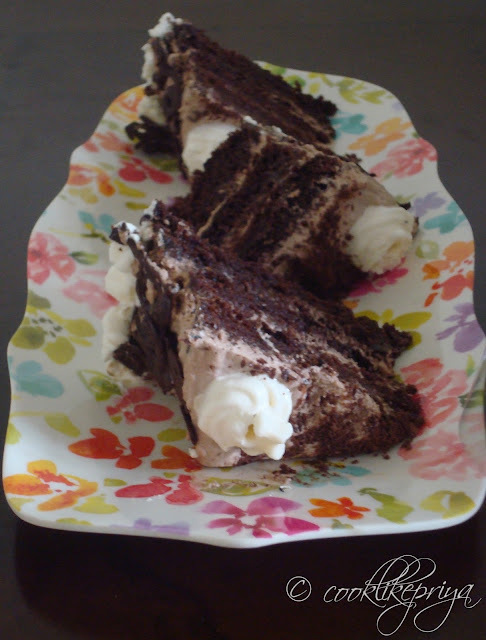 I tried to mix and match and this was a result of it, as it has a resemblance of a black forest cake and has moist layers I thought let me name this a Chocolate BlackForest, sounds cool right? . But nevertheless he loved everything about the cake. Preheat the oven to 350 F / 180 C degrees. Grease two 8" round cake pans. Line the bottom of each pan with parchment cut to fit. Flour the bottom and sides of each pan, tapping out the excess flour. In the large bowl sieve flour, sugar, cocoa, coffee powder, baking powder, baking soda and salt. In another bowl combine the wet ingredients - milk, oil, and eggs. Beat this mixture at medium speed just until smooth. The batter will be very thin. Pour it evenly into the three prepared pans. Bake the cakes for about 20 to 25 minutes, until a toothpick inserted in the centre comes out clean and the cake springs back when very lightly touched. Cool the cakes in their pans, on racks, for 10 to 15 minutes. 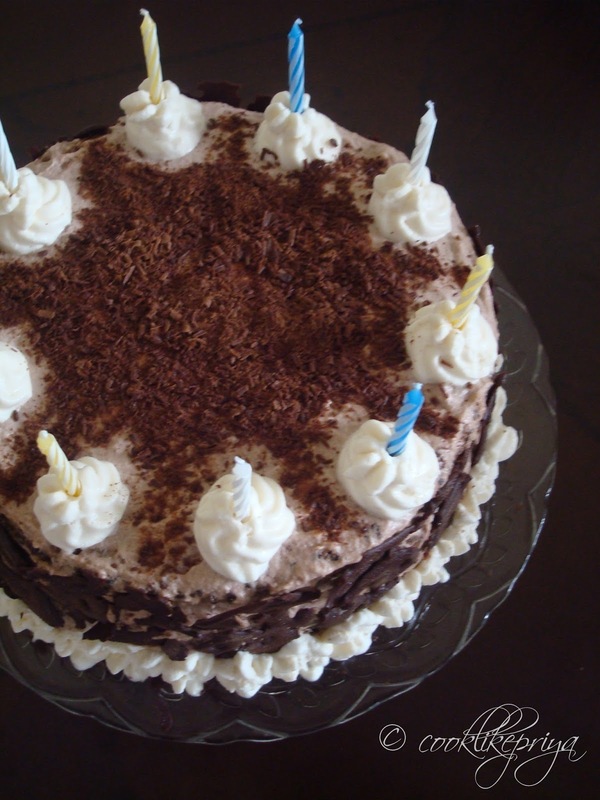 - Do not over mix the batter and tap on the counter top once the batter is on the cake tin. Now add the cocoa paste and icing sugar, whisk again until frothy it takes under a minute. Stop now if you are too ambitious and whisk for long you will end up with cocoa butter. 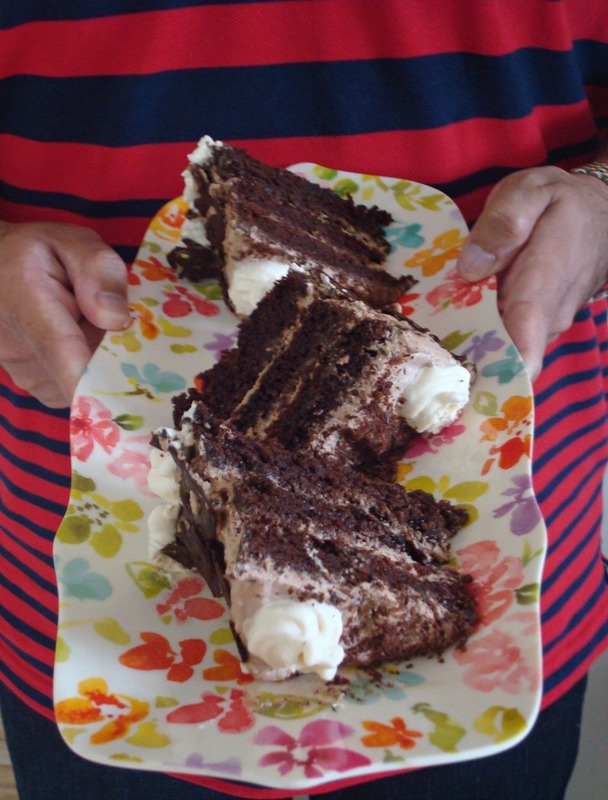 Cut the top layers of the sponge and make 4 layers of the 2 8 inch cakes, Keep on a plate. Prepare the serving tray/ platter drop a small dollop of whipped cream to it and place the first layer and then add a big dollop of the cream on the first layer smoothen it with a off set spatula or a cake knife. Repeat for all three layers. 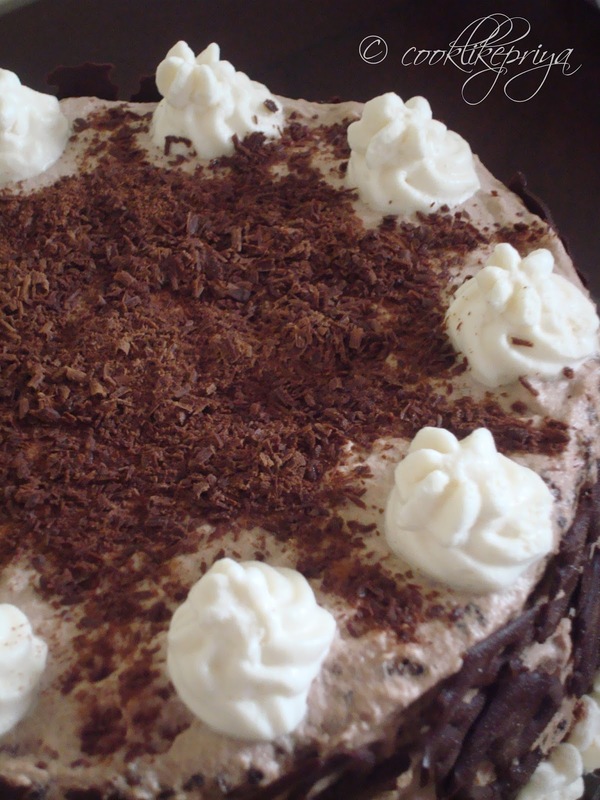 Smooth the outside and top of the cake with more whipped cream. You can also pipe little of the white whipped cream on the sides and top of cake. 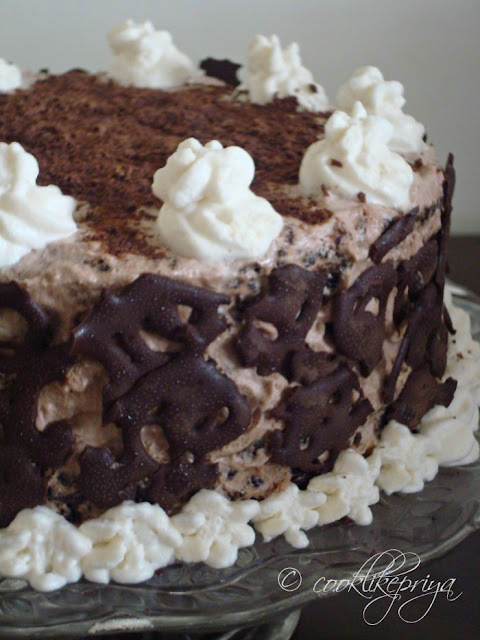 Decorate with chocolate shavings and chocolate curls on the sides. Such a gorgeous and pretty attractive cake, wish i get a super huge slice, well done Sis. 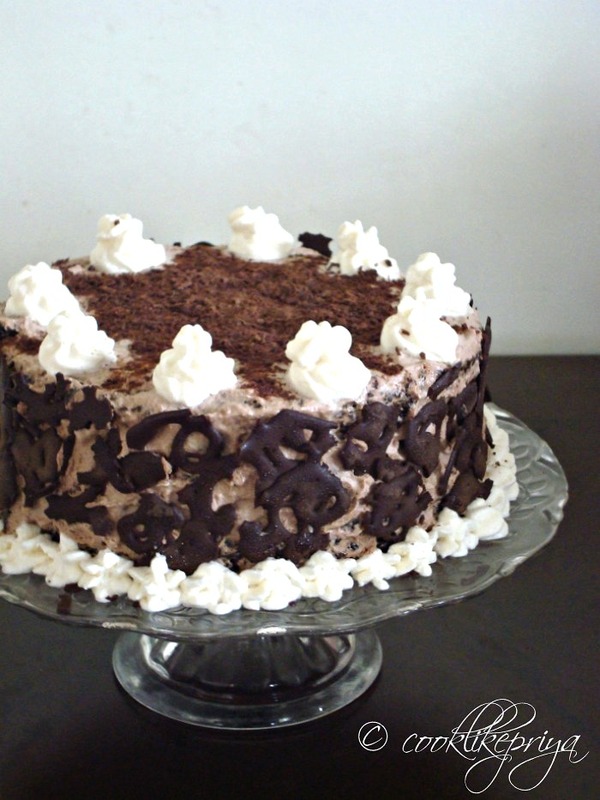 Wow Priya, the cake looks really moist and delicious.I am drooling here! Hope your Husband had a wonderful birthday! Cake looks yum! Wow! What a lucky hubby! Many more happy returns..yummy cake. 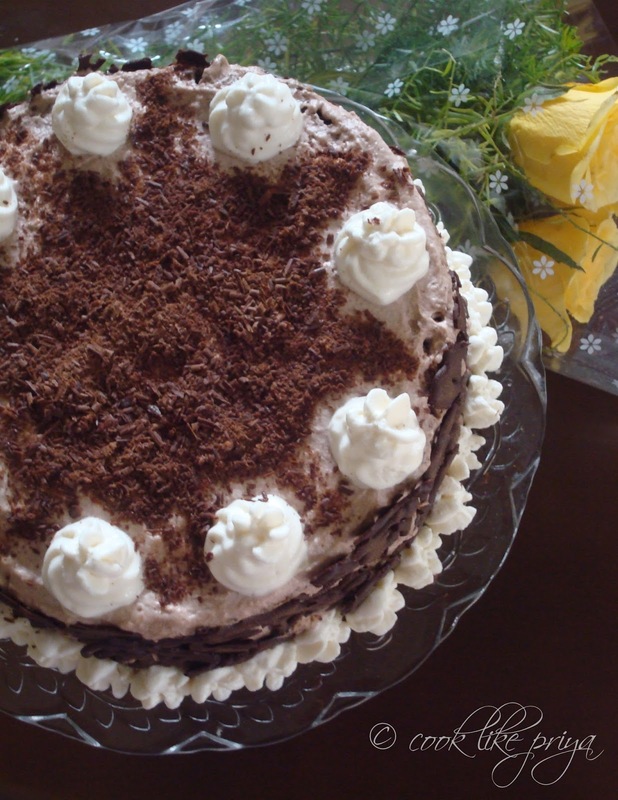 Wow delicious cake... Happy Birthday to ur husband..
yes yes is the cake for me... i want. Perfect for a bday party. Perfectly done dear.. Shall i grab a slice ?? Delicious and mouthwatering cake, looks so soft and yummy. I am a big fan of your cakes. There are few similarities here. 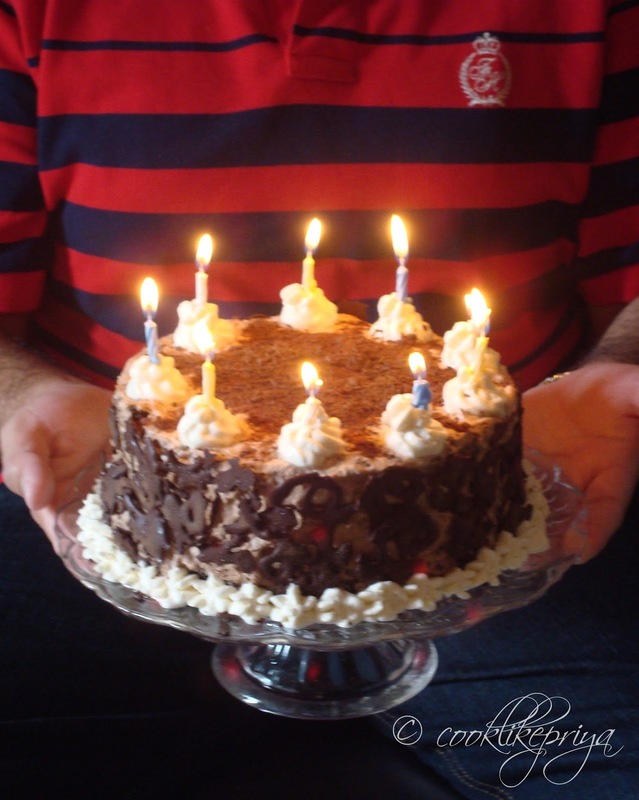 last weekend it was my hubby's birthday too, i too baked a cake but it was my first black forest cake and one more similarity he is my best critic. same same, i think most of the hubbies are same. 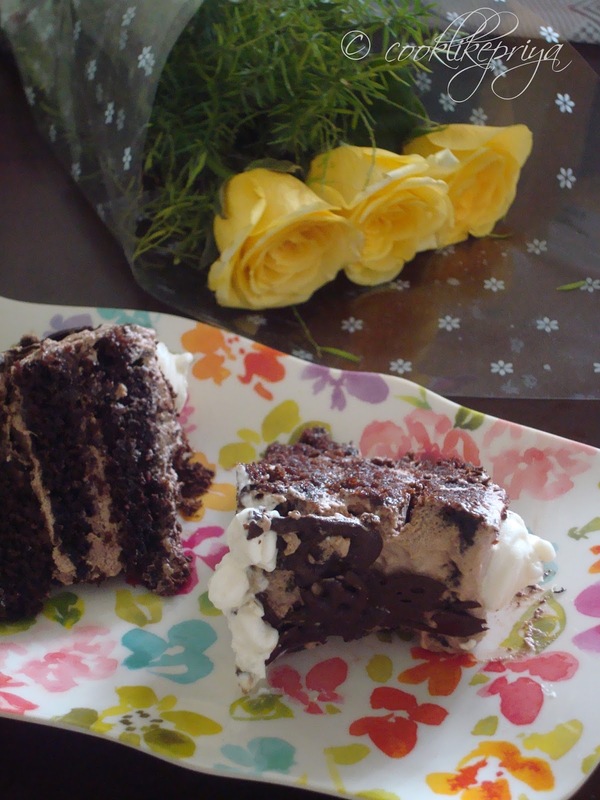 Beautiful cake Priya and black forest is my fav flavor.